I must admit, I knew nothing of the PGT Palgantong beauty brand before purchasing these blushes. I was lured in by the shiny red box with the baroque inspired black floral and lace print, and the cute, four-shade pattern of the Cheek Deco blushes. I picked up both Shades of the Cheek Deco's, CD35 Flamingo Pink and CD45 Sunset Orange. As stated on the company's website, PGT Palgantong Cosmetics originated in Korea during the 1980s. However, after it's 2001 debut, the brand has since been fostered in Japan. 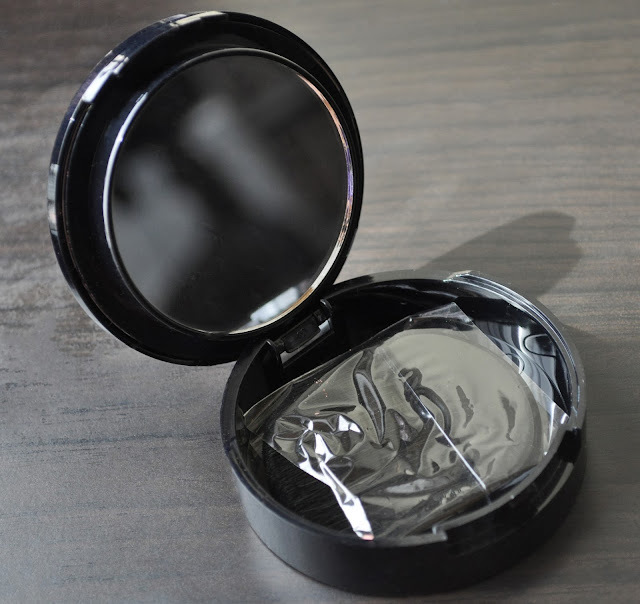 The blushes are packaged in a flip-system case with a compartment that includes a brush and a reasonable size circular mirror. Swatches of the Cheek Deco blush in CD35 Flamingo Pink. The four swatch is of the four shades swirled together. 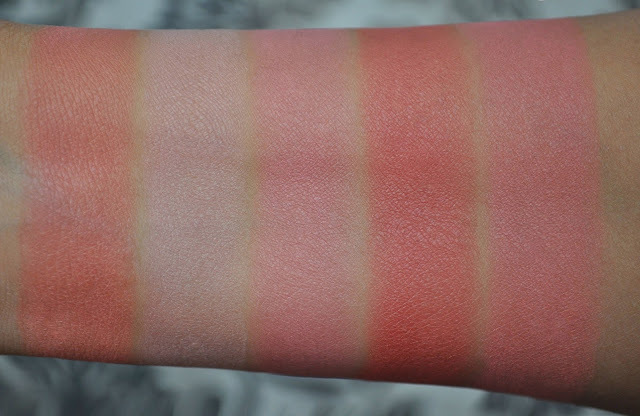 Swatches of the Cheek Deco blush in CD45 Sunset Orange. The four swatch is of the four shades swirled together. Both blushers have a stiff, dry, powdery texture. 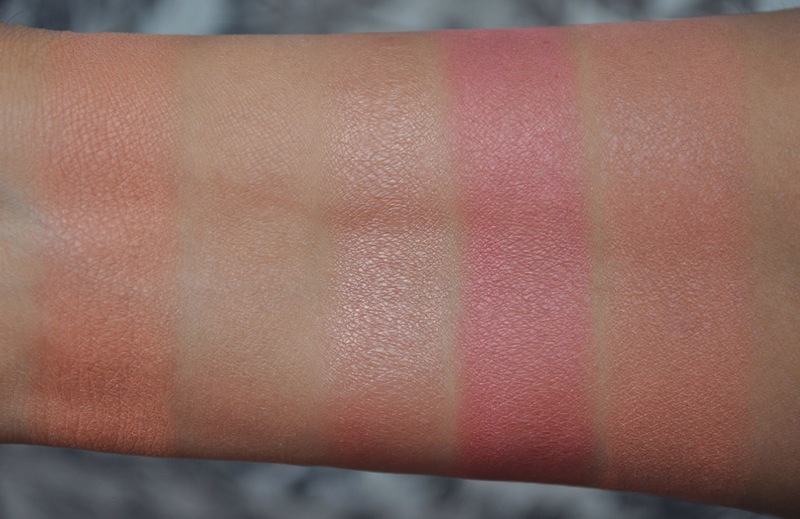 As shown in the swatches, Flamingo Pink is the most pigmented of the two. Although two of the four shades of Sunset orange look nonexistent in the photo, once applied, the blush gives a nice peachy flush to the cheeks. 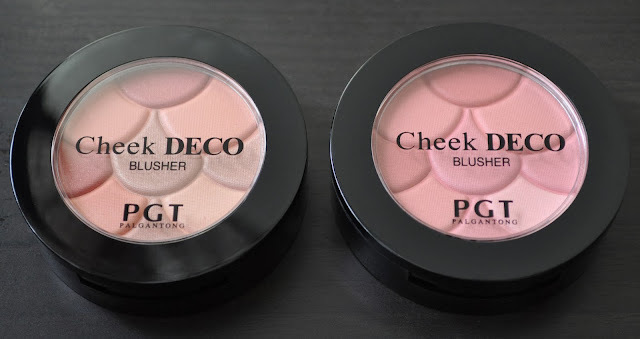 The Cheek Deco blushers didn't have a tester, and if they did, I may have skipped on them. Oh, who am I kidding?! I would have bought them anyway, but they're definitely not must-haves. PGT Palgantong's Cheek Deco Blushers retail for 1,260 ($13.23). Are they like the Guerlain G blushes dry but show up on the cheeks kind of way? The Flamingo Pink blended color is really pretty! Palgantong literally translates to red container in Korean. :) It's a very literal name for the brand and the box. They're not as dry as the G blushers, and much more pigmented. I wore Flamingo Pink today, and it lasted several hours, very impressed. Omg...CD35 is amazing!! I've seen these somewhere and I love love the shades in that blush! i totally didn't think they'd be so pigmented! They are! And they also have great wear time, about seven to eight hours! Love it! Love the shades. You are right, they are a must have. I will def check on them.